Which Belay Device Should I Buy? Sliding X: Too Much Extension? This website aims to break down the technical barriers of rock climbing and empower learning climbers. Use the toolbar above to navigate through basic, sport and traditional techniques. You'll find instruction on how to tie knots; place active and passive protection; lead sport climbs; set top rope, bolted and multi-pitch anchors; how to belay for top-rope and lead climbers; and many other specific techniques. Note: We are not professional instructors and you should not use this site as your only form of instruction. Use this site to reinforce the skills you learn from a professional instructor in person. Nothing can replace the quality of in person instruction. Always rely on manufacturer instructions when using climbing equipment. We do not take responsibility for any injury, epics or death that may take place after reading this website. 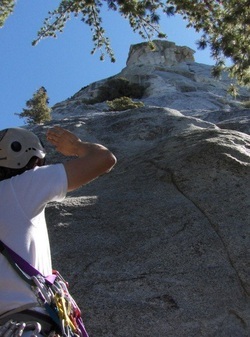 You alone are responsible for understanding how to use your climbing equipment, executing safe techniques, and climbing safely. 2015 Update: Well, we made this website a few years ago and a lot has happened since then. We got married (yay!) and climbing continues to fuel our lives, love, and sanity. As we started more whole-hardheartedly pursuing other aspects of our lives (like careers), and getting into other sports (surfing is awesome!) we were so glad that we knew the nuts and bolts of climbing and could head to the crag whenever we wanted. We haven't been pushing the grades, so much. Rather, climbing is just always there. We remember the days when we were befuddled at the idea of leading outside and trad climbing and are so grateful that we had friends and resources to help us break down those barriers. Hopefully this website can be something like that for you so climbing can become whatever you need it to be in your life. Get out there and use your experienced friends - they are the BEST resources for learning how to be safe and have fun at the crag. We are Rob and Cristina. We have been climbing and skiing together for more than two years now. We are avid adventurers who love the mountains, canyons, rivers and forests of this country and the world. For the first year and a half of our partnership, we bouldered and climbed sport together throughout California's Mojave desert with sun-burnt shoulders and leathery finger tips. The summer of 2010, however, found us in Western Massachusetts only 15 minutes from a climbing crag with many aesthetic traditional routes. With little experience climbing "trad," we were frustrated with the barriers of climbing the routes we pined after. The gear was expensive, we were unsure of how to use it, and no one around seemed interested in showing us. And yet, the beautiful lines at that crag continued to call our names. We spent our evenings reading Climbing Anchors by John Long and searching for whatever material we could find on the subject matter of placing traditional climbing equipment. We became increasingly frustrated with the lack of consolidated, quality information available on the web about some of the more complicated techniques needed for climbing. After many months of study, practice and execution, we decided to make the information we gleaned from our studies available in one location, accessible to everyone. Thus was born ClimbingTechniques.org. We tell you this story so that our website has utmost transparency. We are not professional climbers or instructors. We just love the sport and want to share our passion with others. Are there other techniques you would like to see on the site? Do you have a killer tip that you would like to share? Do you have any critiques? Write to us. We want to hear from you.